Ground Penetrating Radar (commonly called GPR) is the general term applied to techniques which employ electromagnetic waves to map structures and features buried in a visually opaque structure, e.g. soil, concrete, brickwork, tarmac, rock, wood and ice. 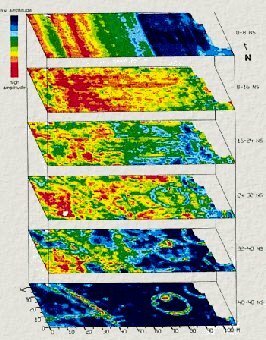 It is a non-invasive sub-surface imaging technique that has been developed since the 1970s for shallow, high-resolution, subsurface investigations of the earth. GPR is a successful example of the exploitation of ultrawideband radar and typically a GPR with a range of 1 m would operate over the range 300 MHz to 3,300 MHz. 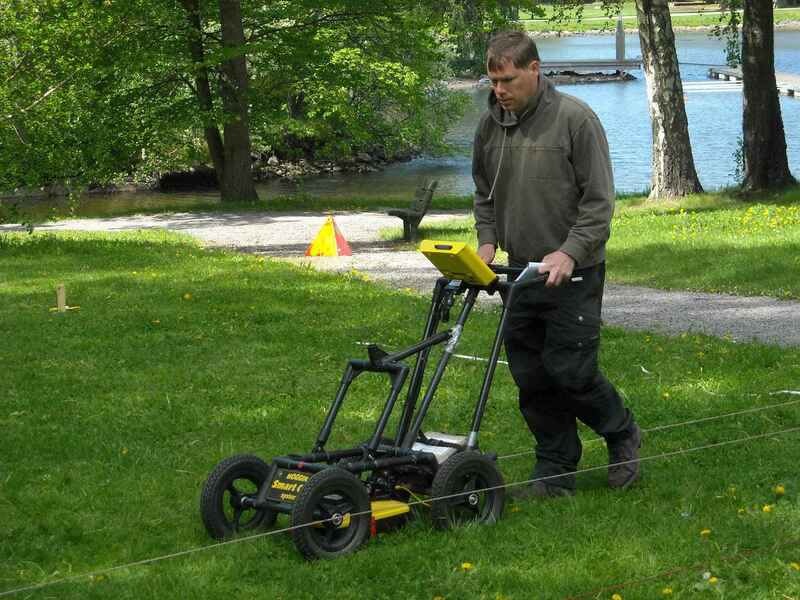 GPR is a method that is commonly used for environmental, engineering, archeological, and other shallow investigations. It is quick, easy to use and inexpensive in comparison to other investigation methods. The radiation density is absolutely harmless. The typical average radiated power may be in the order of a milliwatt.  GPR uses electromagnetic energy to acquire subsurface information. The GPR is slowly moved over the test area, and the electromagnetic energy is transmitted from the antenna downward into the ground. The energy is reflected by subsurface boundaries at which there are electrical property contrasts. This energy propagate back to the surface where it is received by the antenna. The radar detects the depth, conductivity, permittivity, density and location of subsurface objects. 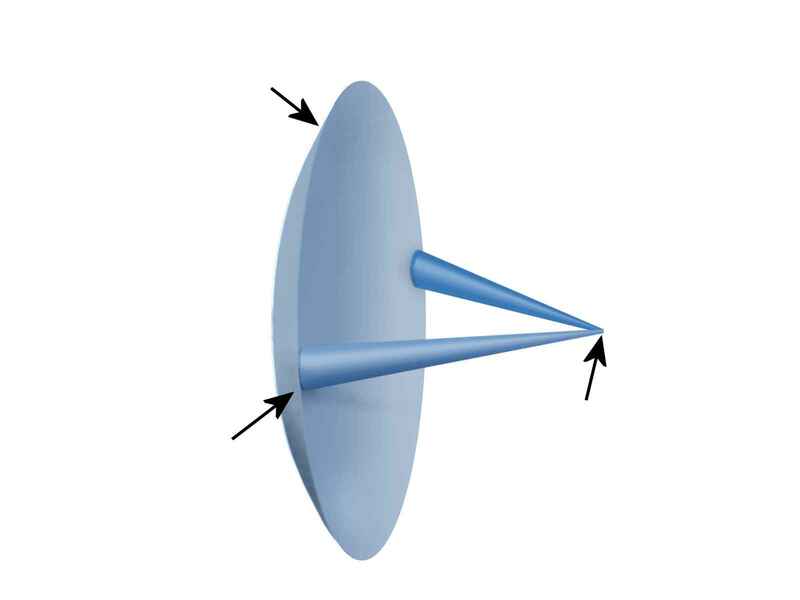 From the transit time of the reflected signal can be calculated a depth. 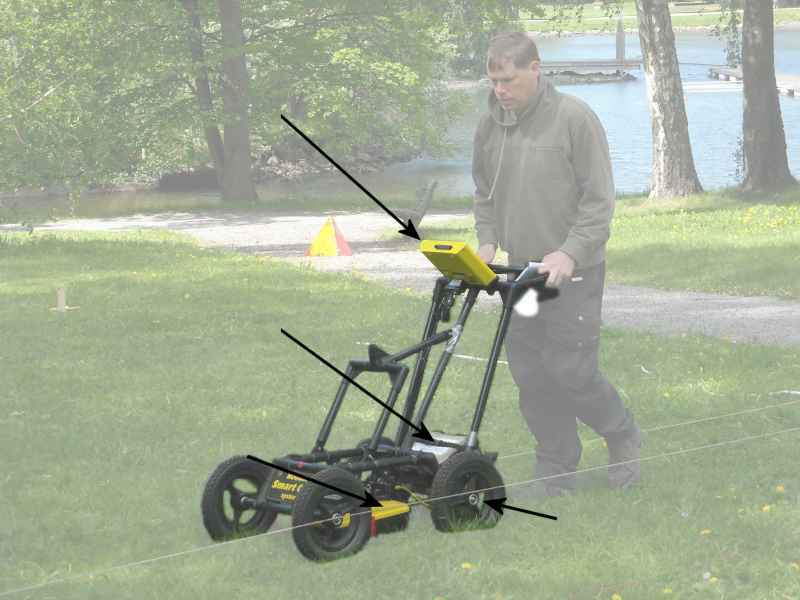 Depending on the system type and ground conditions GPR is capable of probing down to a few tens of meters and provides the user with a “cross-sectional” image of the sub-surface. The technical design of ground penetrating radars can be classified into two groups. GPR systems that transmit an impulse and receive the reflected signal from the target are called Pulsed Radar. These radars use a sampling receiver and can be considered to operate in the time domain. In order to obtain a large bandwidth, the pulses must be extremely short, typically in the range of nanoseconds or even less. Often the radar uses the lower cut-off frequency of zero to get a large bandwidth. In this case the transmitter doesn't modulate a carrier frequency, but gives a very short high voltage pulse to the antenna (typically of amplitudes within the range between 20 V to 200 V). The resulting type of pulse is called a baseband pulse. Its waveform is similar to a “Mexican hat” and is mathematically described to as the negative normalized second derivative of a Gaussian function. GPR systems that transmit individual frequencies in a sequential manner and receive the reflected signal from the target using a frequency conversion receiver can be considered to operate in the frequency domain. These radars are stepped frequency modulated CW- radars mostly. These radars are simpler in structure and consequently cheaper, but they work much more slowly. The transit time here is obtained by an inverse fast Fourier transform. By the integration of a large number of echo signals FMCW-radars provide a better signal-to-noise ratio. The choice of the frequency range is a compromise between the desired resolution and the to be achieved penetration depth. Lower frequencies can penetrate the soil deeper than higher frequencies, but provide a lover resolution. The radar signal is attenuated differently in various soil conditions. Dense wet clays are the most difficult material to penetrate whereas clean dry sand is the easiest. The minimum size of object which is visible to the radar increases as the antenna frequency decreases. Figure 2 gives a rough overview. At 1 MHz, the radar can detect objects in depth of 30 to 40 meters, but it can only distinguish between two objects when they are spaced in a distance of more than 2 meters. The decisive factor for vertical resolution is the effective bandwidth of the received signal. The horizontal resolution is determined by the radiation pattern of the used antenna. 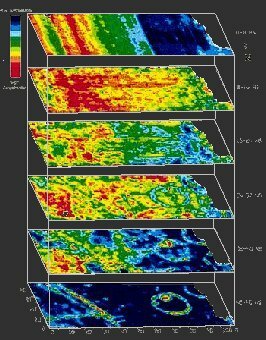 It can be slightly improved by using methods of signal processing, similar to the synthetic aperture radar (SAR), but the results of these methods are limited, because the propagation speed in the various materials of the soil are not constant. Within the used frequency range are also many mobile networks. This radiation field can interfere with the GPR considerably. The user should ensure that his mobile phone is switched to airplane mode during the measurement. One way to minimize such disturbance is a phase-coded modulation. This type of modulation is only possible with narrow-band FMCW radar. Figure 3: Here, many A-scans (rotated by 90 degrees) were assembled into a simple B-scan. The positive pulse portion was filled in black color and can now simulate the intensity modulation of B-scans. Figure 3: Here, many A-scans (rotated by 90 degrees) were assembled into a simple B-scan. The positive pulse portion was filled in white color and can now simulate the intensity modulation of B-scans. Along the moving direction a raw image is generated from the radar data. It maps a cross-section through the soil. Since the antennas cannot have a large directivity due to the low frequencies and the necessary bandwidth, all objects buried in the ground already give an echo signal even if they are not located exactly below the ground radar. This echo signal is nevertheless displayed right below the ground radar. By the larger slant range to the object, that echo is displayed at a greater depth than it actually is. When crossing the reflecting object so a hyperbolic target sign is generated. The real position of the object is the apex of the hyperbola. In the raw image at least one continuous line is always displayed near the surface. This signal is generated from the direct connection of the transmitting antenna to the receiving antenna through the air (often named to “first aerian arrival”). This line will be removed in later processing. Usually there is also a second line caused by the direct wave from antenna to antenna in the soil. With help or radar signal processing this image can be reduced to the actual positions of the objects using a variety of digital filters. These filters reduce scattering losses, the noise and the phenomenon of interference from various inhomogeneities which actually are not objects (also called ground clutter here). At the same time the amplification factor can be increased as a function the run time in order to compensate for attenuation in the soil. A translation of the run time in a distance/depth, however, is not so simple. The velocity of propagation of electromagnetic waves in the soil varies strongly. In dry soil, the propagation speed is only half as large as in the air. In wet sand and clay it is reduced to only a quarter, in water even on little more than a tenth. These differences must be known and may be, for example, estimated by measuring the resistance or compared with seismological measurements. However, final confirmation can only be made by a core drilling. The result of a single radar measurement can be represented as A-Scan on an oscilloscope. An A-schan provides amplitude-time record of a single measurement over a target. This oscilloscope displays on the X-axis a time line, and on the Y-axis the amplitude of the received echo signals. The resulting figure on the oscilloscope rotated by 90 degrees is called “trace”. A B-Scan can be generated of a large number of such traces. At a B-Scan on the X-axis the traveled by the radar path is plotted and on the Y-axis the timeline of. The echo signals are now brightness modulated or visualized by color schemes on this surface. This B-scan is the intersection through the soil along the path traveled by the radar. From several of these parallel cuts a maplike top view of the test area can be generated as a so-called C-Scan, the X- and Y-axes are now two-dimensional distances at the test site. A threedimensional image as like as Figure 5 is composed of a number of C-scans, each for a given depht. All these representations are called radargram in publications. The terms B-scan and C-scan are peculiar to ground-penetrating radars and must not be confused with A-Scope, B-Scope, and C-Scope in radar displays of surveillance and tracking radars. 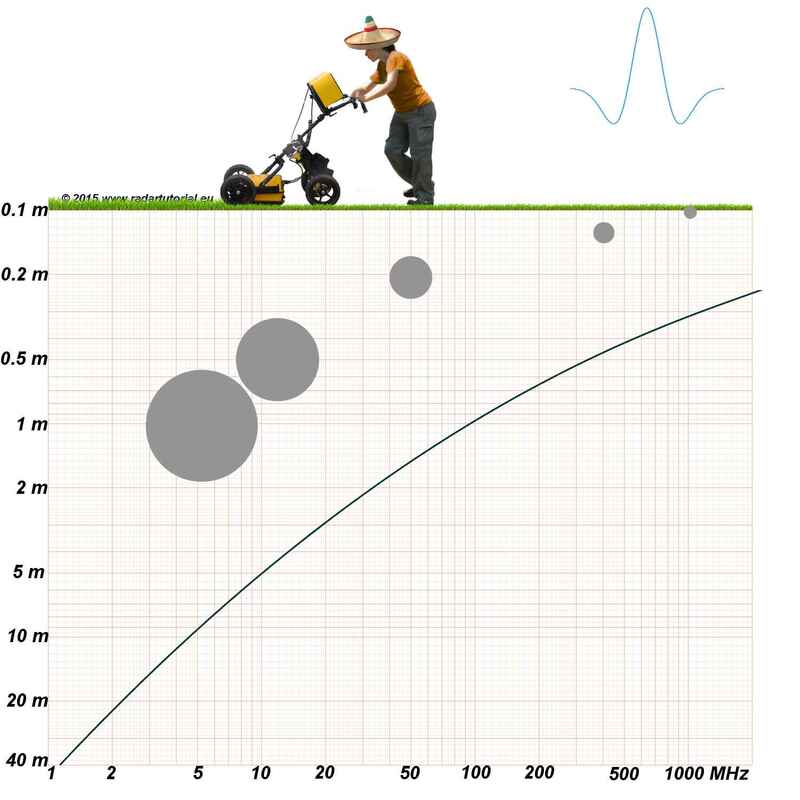 The choice of the antenna is not critical for GPR in the frequency domain. It should cover with its bandwidth the frequency range used. For pulsed GPR (working in the time domain), the choice of antenna is difficult. The antenna should have the same phase center for all used frequencies in order not to change the pulse shape. Thus, for example, a log-periodic dipole antenna is not suitable. In addition, for portable equipment must be ensured small geometric dimensions, so that the devices don't become too unwieldy. 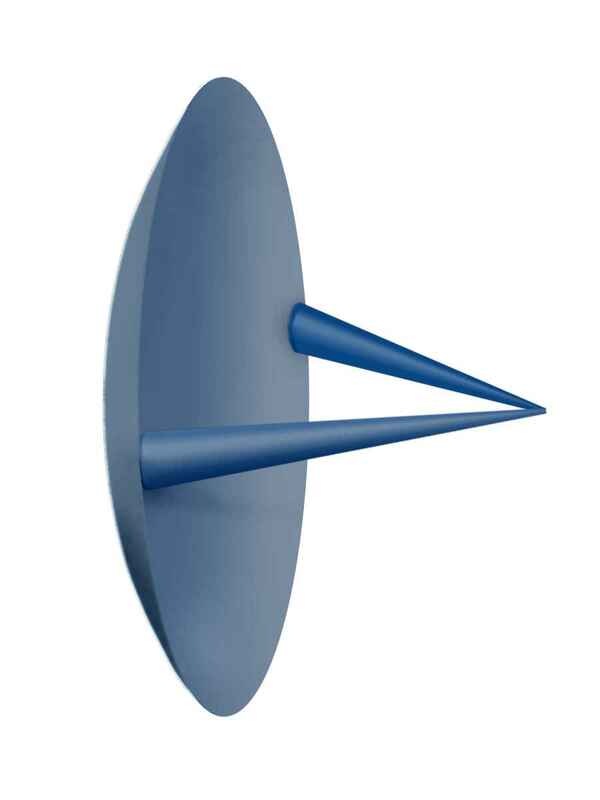 Impulse Radiating Antennas (IRA) are developed for ultra-wideband applications especially. They consist of a dipole of, for example conical round material in front of a parabolic reflector. They have a good directivity and allow a very high peak field strength. With a diameter of 0.8 m their bandwidth ranges from 0.2 to 6 GHz. 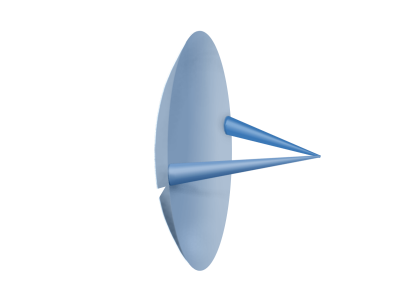 By a resistive layer between the two radiator halves and the parabolic reflector are avoided unwanted reflections of pulse components having a very high frequency. The IRA is constructed much more compact as compared to an electrically equivalent linear tapered TEM-horn antenna. GPR is available as handheld devices, which can be manually positioned on the floor or walls. These devices are also suitable for examining non-metallic materials for cracks or voids. Bigger units can either be dragged or pulled along the ground or may be incorporated into a small trolley that is pushed by a single person. The housing of the antennas and the trolley should be constructed of non-metallic materials, so as not to interfere with the antenna operation. Installation in a car is also possible, but here it is fitted with a non-metallic boom either way ahead or way behind the autobody. Ground-penetrating radar can also be transported as towing capacity with a helicopter such as the “HERA” (HE licopter RA dar) from the Swiss company RST. The GPR MARSIS is an integral part of the Mars Express spacecraft and examined the Martian soil to a depth of 5 km at frequencies from 1.8 to 5 MHz. The distance between the antenna and the Martian soil is between 300 to 800 km. GPR is used to map geologic conditions that include depth to bedrock, depth to the water table, depth and thickness of soil and sediment strata on land and under fresh water bodies, and the location of subsurface cavities and fractures in bedrock. Other applications include the location of objects such as pipes, drums, tanks, cables, and boulders, mapping landfill and trench boundaries mapping contaminants, and conducting archeological investigations. Integration of GPR data with other surface geophysical methods, such as seismic, resistivity, or electromagnetic methods, reduces uncertainty in site characterization.